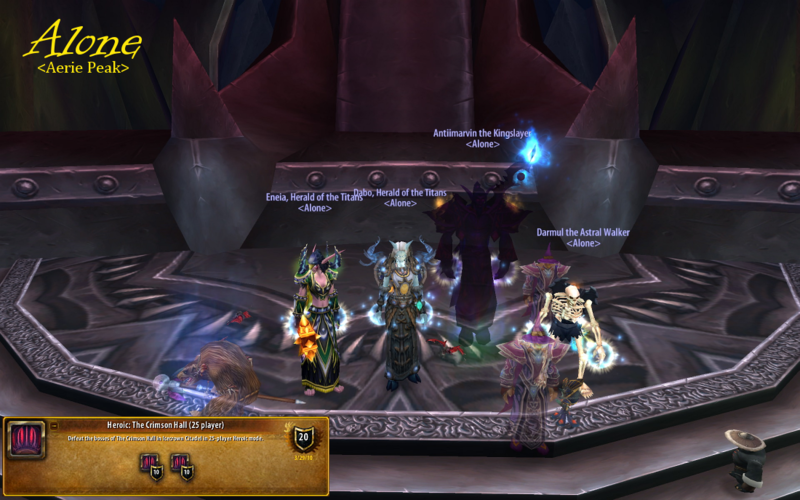 5th "hard mode" down in the first week, although I can't say that the fight was much different than the original... Seems though we managed to four man it, along with our 2 vampire bats, lil' KT, kung fu panda, a timbermaw bear, and 2 archmage vargoths. GO US! What so you 4-manned H BQL 25? Why don't you just piss on the other 21 people that helped kill her? This is the most ghetto picture ever and shouldn't be posted on your front page of the website. It's an outrage! A scandal! You can't just go and make up a screenshot kill like that! As we speak im getting in the empty bathtub buck naked with some razor blades and i'm about to slit my wrists over this. You won't be seeing me in raid tonight because I will be dead...all because of you and this picture. WTFBBQSAUCE!!! Now you made me speak 133t speak which I hate so i'm going to slit my throat after i slit my wrists now. Good job, dabo. You killed me. -.- Not my fault everyone left us! But I will make an edit for your remembrance! That's very sweet of you, Eneia. Apparently I forgot to cut up stream and did across river so I'm not dead. I guess I will be there for the raid tonight. Edit: Oh by the way, looking on the Thundergoats recruitment thread, they seem to be getting a little nervous that we are catching up to them. I know we aren't trying to compete but GO US! !